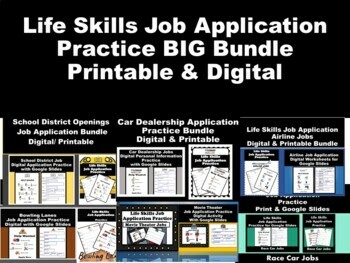 This bundle contains 6 of my Job Application Practice activities. Each one has a "Help Wanted" sign with jobs specific to the theme (Airport Jobs, School Jobs, Bowling Alley Jobs, Cafe Jobs, and Car Dealership Jobs) . Also included is the Personal Information Practice forms activity.